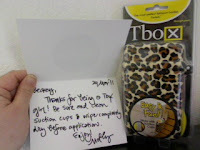 Tbox Girl : Molly Watson is a mom of three little boys, and an inventor on the side. She thought of the Tbox after years of trying to discreetly stash tampons into a floral box--so her husband would not have to view them. Now, with more boys in the house, the need for the Tbox is even greater. No more waddling, and her tampons have a safehouse. Girls and Women are tired of announcing that it isour time of the month. We are tired of waddlingfrom the potty to the place where the tamponsare stashed. Then, all week, those uglytampon boxes are shouting from floors,toilet tops, sinks and towel racksthat Aunt Flo is in town. ♥ I receive no monetary compensation for this review. I was provided a Tboxto try and give my honest opinion.